Hello from New Orleans! It’s hot as heck! I got here on Wednesday and have just been bopping around the city and bayou. I spent a leisurely day by the pool at the Country Club. I explored the French Quarter with my librarian krewe. 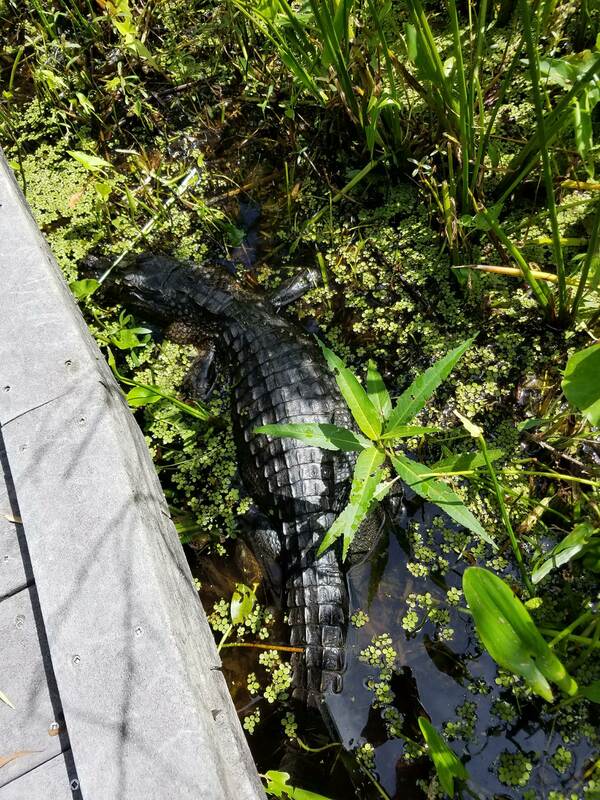 I saw a gator yesterday in the Barataria Preserve! I started conferencing on Friday with a session on Ex Libris Leganto. The session featured an implementation story from the University of Miami, who worked with their bookstore to make textbooks more accessible. It also featured some Ex Libris folks doing demos and talking about use cases with the system. One of the most powerful features of Leganto is its integration with the learning management system of the institution. It puts library resources in places the students are already using; they don’t need to access the library separately. Leganto also puts a lot of power in the hands of the instructors and takes some of the burden off libraries to create and organize course readings. Leganto has a “cite it” browser plugin that lets instructors search freely online and add materials to their course. Leganto searches library holdings and connects the record in Primo, so instructors don’t need to know how to proxy the link to get their students an accessible copy. Like all the Ex Libris products, there are good analytics and lets the instructor see how frequently students are accessing and interacting with their readings. The opening session with Michelle Obama looked a little too crazy, so I retired to an author reception for ALA Editions at NOSH. On Saturday, I had a committee meeting with LITA ARC and caught the last half of Executive Perspectives: A Conversation on the Future of the Library Technology Industry. The panel was moderated by Marshall Breeding and featured Berit Nelson (Chief Product Officer at SirsiDynix), Jane Burke (VP Strategic Initiatives at ProQuest), Beth Jefferson (Co-founder and Chief Executive Officer at BiblioCommons Inc.) and Mary Sauer-Games (Vice President, Global Product Management at OCLC). In the afternoon, I presented my session Leading with Data: Using Stats from Across the Library to Inspire, Inform, and Motivate Your Team with Jessica Hayes from Auburn University. After that, I attended New Discoveries in Reference: The 24th Annual Reference Research Forum. It was a great program! The forum featured “Reframing Reference Through Participatory Visual Methods,” presented by Eamon Tewell, Reference & Instruction Librarian, Long Island University, Brooklyn. They did a project investigating students experiences with finding information outside the library using a photo study. Their results showed that students liked one-on-one information experiences at the point of need. The second lightning talk was “Reference on Demand: Testing an ‘Uber Reference’ Service in an Academic Library,”presented by Brian D. Moss, Reference Services Manager, University of Kansas Libraries. At Kansas, they tested on demand reference service that allowed students to summon a librarian on demand the same way they would order an Uber. One of their libraries is abundantly used by undergraduate researchers, but their reference numbers were curiously low. They implemented the on-demand system in March, but have not had any takers yet. Cool idea though! They’re going to try a more aggressive marketing strategy to see if they can drum up some interest. “You Didn’t Say ‘Hola’: What Happens When the Reference Script is Altered,” presented by Julie Marie Frye, Education Library Head, Indiana University and Maria Hasler Barker, Assistant Professor, Sam Houston State University. They looked at the opening statement of the reference interaction in a bilingual setting (English/Spanish). Their transcript analysis was very cool; they looked at both efficiency (how many clarification attempts were made by the librarian until the patron question emerged) and effectiveness (how well the librarian answered the question). On Sunday I attended the LITA Top Tech Trends session moderated by Marshall Breeding and featuring Jason Bengtson from Kansas State University Libraries, Reina Williams from Library of Rush University Medical Center, Justin De La Cruz from Atlanta University Center Robert W. Woodruff LIbrary, Marydee Ojala from Information Today Inc., and Laura Cole from BiblioTech. I liked that the schedule this year was a little more refined, but I ended up sitting on the floor at most of the presentations I attended or squished next to all of sweaty humanity. That’s partially because I’m always right on time (just a little late), but I also think ALA should put more stock into the scheduler. My presentation had around 140 people rsvp and around 115 people show up. Our room had 90ish chairs. If we have fewer sessions, maybe bigger rooms? Anyway, all in all it was a great conference. I had a chance to catch up with a bunch of folks I don’t see that often and network with some new friends. New Orleans was a fantastic and hospitibile venue. Till next year! This entry was posted in Event, Presentation, Travel. Bookmark the permalink.